Indian Prime Minister Narendra Modi and his right-wing BJP party appear to be facing a political setback, with major swings against it in three key state elections. The opposition Congress Party looks set to form governments in Chhattisgarh and Rajasthan, while Madhya Pradesh heads for a photo-finish. Correspondents say a win for the depleted Congress in at least two states will see it regain credibility. General elections are due in 2019. Early results in the central state of Madhya Pradesh put the Congress well ahead, but the BJP has been making a late comeback. It is still unclear which of the parties will eventually form the government there. However the opposition, headed by Rahul Gandhi, has a clear lead in Rajasthan and Chhattisgarh, which are former BJP strongholds. Modi, whose brand of Hindu nationalism helped him come to power in 2014, campaigned aggressively in all three states. Should Narendra Modi be worried? Narendra Modi's grandiose promises - especially to create more jobs and increase incomes of farmers - have begun to bite. A lack of jobs and farmer distress will be the crucial issues next year, although whether India's farmers will vote as an "angry bloc" against the government is unclear. But the lack of a competitive leader to take on Modi, and the failure to offer an alternative narrative of hope to the people will still make it difficult for the Congress and its allies to mount a credible challenge to Modi. Tuesday's verdict will surely rejuvenate the Congress, but that may not be enough to defeat a formidable ideological adversary like the BJP next year. Regional parties - the Telangana Rashtra Samiti (TRS) and the Mizo National Front (MNF) - are headed for a landslide victory in these states. BBC Hindi's Vineet Khare says the Congress may have been overconfident in Madhya Pradesh ahead of the results. "A large banner congratulating senior leader and former minister Kamal Nath was already up at the Congress headquarters yesterday. But now it looks like both parties are still racing to reach the halfway mark they need to win. They might need help from an ally to actually form the government," our correspondent reports from Bhopal. 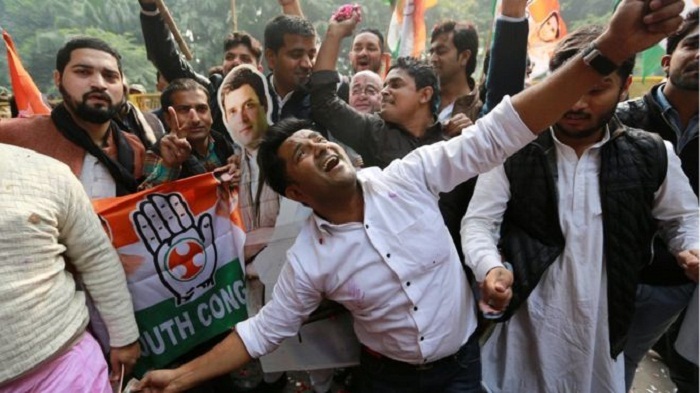 "The reason behind the Congress victory is anti-incumbency because people feel that there is a lack of development in most parts of the state despite 15 years of the BJP governing there," reports BBC Hindi's Salman Ravi from the state capital Raipur. "Farmers in particular, who have been angry about what they see as a lack of state support for their profession, voted for the Congress in large numbers. People in the state were clearly looking for change this time." And issues of rural discontent - such as unemployment, lack of development and farming distress - are being seen as issues that could affect ballots next year. BBC Hindi's Nitin Srivastava who is in Rajasthan, has been posting photos of the starkly different atmospheres at the BJP and Congress party offices in the state.